Here's a look at a new accessory in the making! I had ordered some hand-crafted clay macarons from AiClay last year (for both SD and MSD sizes that are necklace charm sized). She had adorable macaron-themed jewelry for humans, as well as loose pieces packaged in little boxes for doll props. They just looked perfect for this little accessory project of mine that was inspired by delicious and luxurious Japanese jewelry brand Q-Pot. These macaron charms were originally supposed to adorn necklaces on their own, with rhinestone accents. However, they were so dainty, the weight of the clasp would pull the necklace back on the doll's neck. I was a little disappointed that I couldn't make anything suitable with these sweet charms, so had to keep them while I figure out what else I can do to incorporate them into. Finally last month, I came across some tiny gold eiffel tower charms that would work perfectly with the macarons! After all, these sweets originated from France, so how apt! 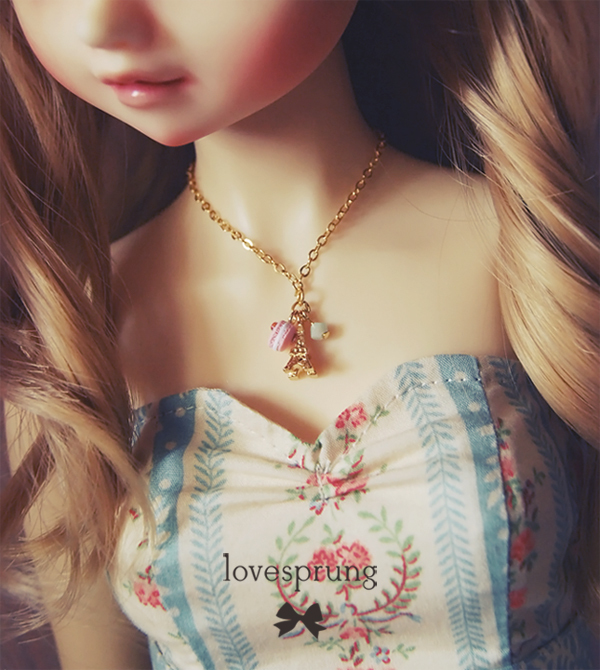 :D Maname, my SD girl, is modeling the first necklace made. The macaron is actually an MSD sized one because I found the SD one was still a little too large for a dainty necklace project. 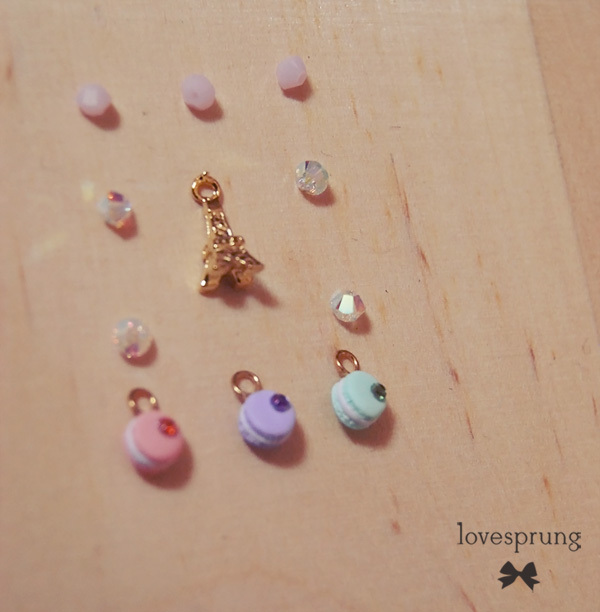 Each necklace will have a rhinestone embellished macaron (very minimal, just 2, since they're so small), a gold eiffel tower charm and a swarovski bicone. They come in three combinations, with pink, lavender and mint coloured macarons. The pink macaron would be paired with a mint alabaster AB swarovski bicone; the lavender with rose alabaster swarovski, while the mind macaron will go with a clear AB swarovski bicone crystal. 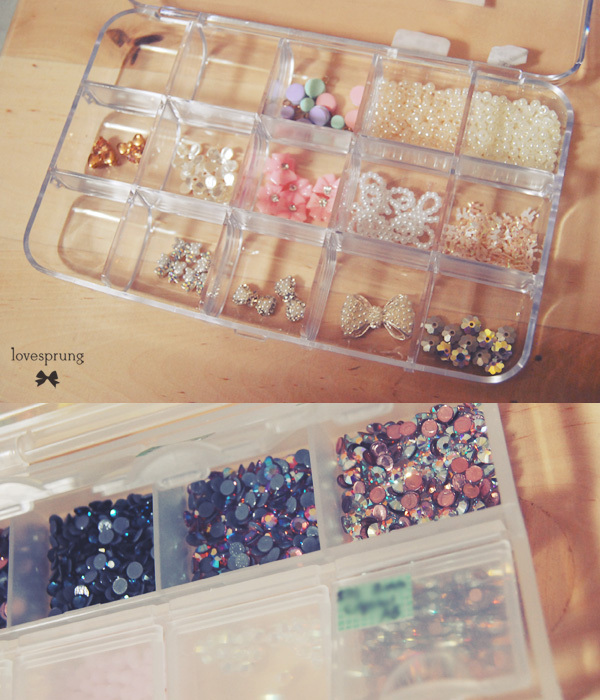 I'm in love with swarovski crystals. *_* My recent trip to KL brought me five new colours of hot-fix swarovski crystals that I can't wait to embellish clothes and shoes with! I even broke down and bought a pair of Fluffy Yarn leggings in peach from Uniqlo because I'd like to see if we can make cardigans for SD girls like Gelato Pique's Moco Moco clothing. *-* I've been procrastinating a little too much for comfort in 2012. Let's hope I regain my 'fire' this year!